Eight of 22 major aquifer networks showed increases in concentrations of deethylatrazine, a degradation product of the herbicide atrazine. U.S. Geological Survey (USGS) scientists have completed the most comprehensive evaluation to date (2014) of decadal–scale changes in pesticide concentrations in groundwater of the United States. Such assessments are essential for tracking long–term responses to changes in pesticide use and land–management practices. Groundwater samples were analyzed for 35 pesticide compounds for the 20–year period from 1993 to 2011. The samples were collected from 1,271 wells in 58 nationally distributed well networks. Networks consisted of shallow (mostly monitoring) wells in agricultural and urban land–use areas and deeper (mostly domestic and public supply) wells in major aquifers in mixed land–use areas. 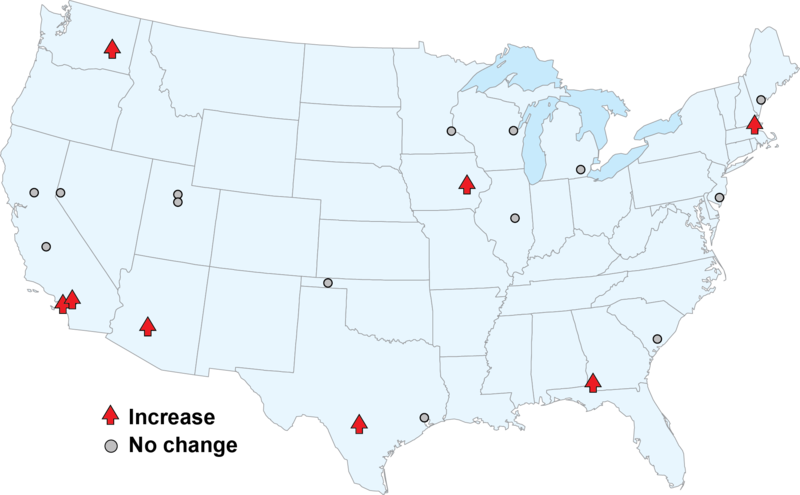 Wells were sampled once during 1993–2001 and once during 2002–2011. The five most frequently detected pesticide compounds—atrazine, deethylatrazine, simazine, metolachlor, and prometon—each had statistically significant (p < 0.1) changes in concentrations between decades in one or more types of well networks, nationally aggregated by land use. In agricultural networks, concentrations of atrazine, metolachlor, and prometon decreased from the first decade to the second decade. In urban networks, deethylatrazine concentrations increased and prometon concentrations decreased. 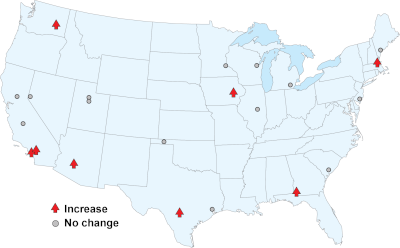 In major aquifers, concentrations of deethylatrazine and simazine increased. Altogether, 36 of the 58 individual well networks had statistically significant changes in concentrations of one or more pesticides between decades. The magnitudes of median decadal–scale concentration changes were small—ranging from –0.09 to 0.03 micorgrams per liter (µg/L)—and were 35– to 230,000–fold less than human–health benchmarks. This study was funded by the USGS National Water–Quality Assessment (NAWQA) Program. Pesticides in groundwater of the United States–Decadal–scale changes, 1993–2011: Groundwater, 2014, 52, Issue S1, pages 112–125, doi:10.1111/gwat.12176.